Details Matter! | MTKC - MT Kitchen Cabinets, Inc. San Mateo, California. Home » Blog » Details Matter! With literally thousands of options in today’s remodeling market, choosing the right materials for your home can be rather confusing. Worse yet, picking products that suit your needs and finding the right designs and styles that fit your home are even harder. The key to remodeling your home is investing wisely and not overlooking the little details that build tremendous value in the long run. In a kitchen remodel, the bulk of the expense is cabinetry, countertops, and appliances. Since these items provide the three most important functions of a kitchen (storage, preparation and dining surfaces, and cooking and refrigeration), you should purchase the highest quality material you can afford. On that note, your budget should cover more than just those three items; budgeting in other extra details during your planning may well take your remodel from good to great. Paint matters. Repainting a room yourself is one of the most cost-effective ways to change the appearance of a room. A few gallons of paint will run you about $100, but the results can be dramatic. Large areas of colors are always one of the first things people notice, and color greatly affects the ambiance of a room. For instance, painting a room tan or green will make the room warmer. Alternatively, painting the room grey creates a cooler, more contemporary effect. And the greatest thing about paint is, unlike buying new appliances or changing a room’s layout, you can repaint again and again until you find the right shade without incurring huge costs. Lighting matters . Lighting is a key element in a successful remodel; yet many people miss it in their planning. The three main types of lighting include ambient, task, and accent lighting. Ambient lighting, or general illumination, includes sunlight, under-cabinet lights, ceiling lights, and pendants. Ambient light provides an overall lighting to the room. Task lighting is meant for specific task areas, such as over the sink or stove. And accent lighting is focused and can draw attention to display items or illuminate glass cabinets at a wet bar. Strategically utilizing all three types of lighting can significantly improve the appearance of your new kitchen. Molding and trim matter. Depending on the style of the room, molding and trim are often what “finishes off” the cabinetry, as well as the room itself. Instead of a plain toe kick for the cabinetry, try adding a baseboard. And in appropriate areas, use a furniture base for added effects. You can also add extra molding or onlay to areas such as a wooden hood or a stand-alone glass display cabinet. Trim around the room adds elegance and color. Paint, lighting, and molding & trim are only a few of the often forgotten aspects of a remodel. Other elements such as handles, window treatments, plumbing fixtures, and other personal decorative accents will all contribute to the remodel itself. Be sure to plan accordingly, budgeting these items into your remodel. 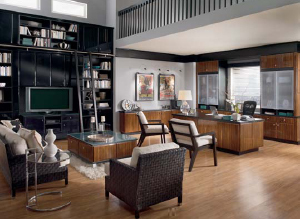 The above content was published in Home Digest Magazine in November 2006. For reference to the actual copy, please download this pdf file.